We’re just over half way through 2018 so now is the perfect time to sit down and take a good hard look at some of the country club digital marketing trends we’ve seen this year. It’s also a great time to look back at your country clubs digital marketing efforts, put some thought into marketing initiatives that did and didn’t work, and figure out how you can expand on this years wins to end 2018 off on a high note. As the importance of shifting marketing strategies from traditional to a digital-first mentality grows, the total global marketing spend is set to reach a massive 1.3 trillion by 2020. 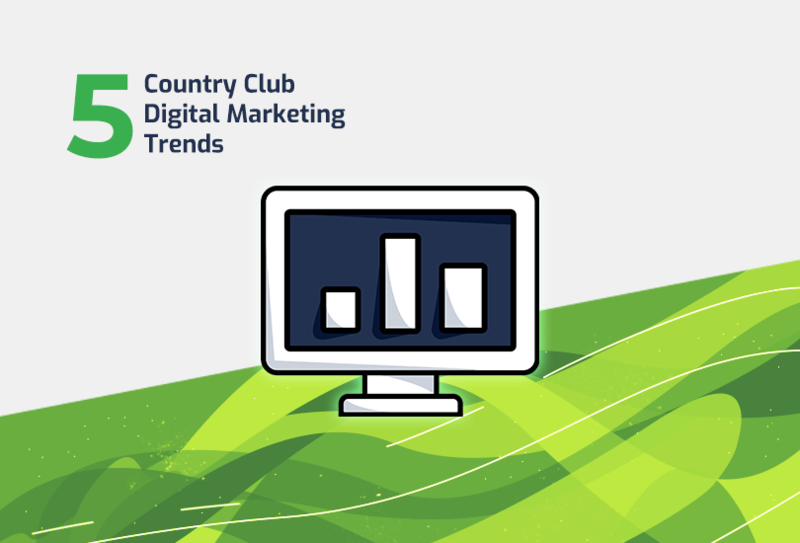 We’ve put together five digital marketing trends for country clubs that we feel you should be putting a lot of thought into and working these strategies into your clubs marketing plan to end 2018 off and before heading into 2019. 1. Start creating video at your country club – like yesterday! The first major country club digital marketing trend in 2018 that we’ve seen is around video, but not just any video format, mobile-first video! Mobile users spend more time than ever with their smartphones. The amount of time spent watching videos on mobile devices has surpassed the time spent viewing videos on more traditional devices, such as desktops and televisions in some age groups. Social channels like Facebook and Instagram have already begun rewarding users and advertisers who create videos by prioritizing their content and pushing out notifications to followers when they start a live video. All of this will likely have an even more significant impact in the years to come. Tip: Create video specific for the platform you plan on posting on. Video displays differently on Facebook/ YouTube vs. Instagram – use video editors that output your video in different dimensions so that your video fits that specific platform! Start compiling video and b-roll footage from around your country club and saving in a cloud file management platform. These can just be short shots (20 – 60 seconds) that you can use in videos down the road. Try creating a time-lapse walkthrough video of your club! With any iPhone, open up the video app and choose time-lapse. Then just walk all through your club for 2 – 3 mins total, which will output a short video! Your club likely has multiple events every month so an easy way to put out video consistently is to create event recap videos. This is insanley simple to create and should take a beginner no more than 15 mins to create. Free mobile apps like Clips on the iPhone or Adobe Spark Video on iOS and Android make this easier than ever to put together quick videos and share them on your clubs social media pages. Personalization from a marketing standpoint is about more than the subject line in your email marketing campaigns. For country clubs, it’s all about knowing who your members are, how they use your club and engage with them accordingly. Analyzing your member’s behavior and then tailoring your marketing message to speak to those different segments! In regards to perspective members that inquire about membership via your website, a great way to respond to them is via a personalized email automation. With an advanced email marketing platform, you can setup automations that will send personalized emails with information relevant to that individual! According to Club Managers Association of America, prospective members – expertly younger ones, significantly prefer their first contact by the club to be in the form on an e-mail rather than by phone or direct mail! You may ask: what is a “mobile-first” website? A mobile-first website is a device-specific version of your website that is built specifically for mobile devices. These types of websites offer your website visitors a completely custom experience. Mobile is certainly no trend, and usage stats are only going to grow year over year. If your country club website doesn’t provide an amazing experience on mobile for members and potential members, this should be a major priority to get corrected. Fact: In 2016, Google stated that for the first time in history, there was more searches on a mobile device than there were on desktop! Creating and sharing short content with your followers on social media is one of the best ways to engage them by offering content that is easily digestible and encourages sharing. People are notorious for skimming content and headline reading, Attention spans are short and are getting shorter every day due to how noisy and crowded the internet has gotten. There will always be a place for the occasional long-form blog or video diving into a topic your audience is genuinely interested in learning more about, but the best way to capture attention and, in turn, new followers (possibly new leads) will be short-form content. Facebook Ads are still grossly underpriced, and we’ve seen some amazing success from them when running lead generation campaigns (check our case study out about it here). If you’re a country club looking for a way to gain new member leads, we recommend starting with Facebook Ads. If you’re trying to attract millennials to your country club it’s important to remember where they are spending their time – 84% of 30 to 49 year old internet users are on Facebook and spend an average of 35 minutes on the platform. To learn about how to get your country club started with Facebook Ads, check out this blog! Long Drive Agency is the leader for country club and golf course marketing, we are committed to growing your properties digital presence. To find out more about how we can help your country club gain new member leads, contact us today!